I'm going to have to make this one quick. 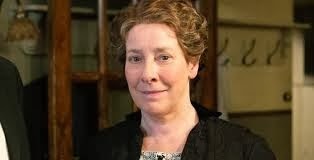 As usual, I've got too much to do and too little time, but I just have to spend a few minutes with my favorite fictional characters, reminiscing over the latest episode of Downton Abbey. Downstairs seemed to have a lot of drama, as usual, and a few of my favorite lines came from a few of my favorite servants. So let's start downstairs, shall we? 1. Thomas is really trying to invent trouble, isn't he? This week he pressed Mrs. Hughes for information, but dear old Mrs. Hughes, stalwart and secret-keeper that she is, wouldn't budge. "You know me, Mr. Barrow; a woman of mystery if ever there was one." 2. Later, that disgusting slimeball, Jimmy, suggests that he might like to take Ivy to a movie in town later in the week. Mrs. Patmore is all over that one, but it's Carson's droll response that I really loved. Mrs. Patmore: Oh, I love that Rudolph Valentino. Ooooh! He makes me shiver all over. Carson: What a very disturbing thought! 3. As we all know, the Ivy's date with Jimmy didn't turn out very well. (I knew he was trouble. Too slick, that one.) Later that night, she's commiserating in the kitchen with Mrs. Patmore and Mrs. Hughes while Daisy listens. Ivy suggests that Alfred would never have done what Jimmy tried to do, and Daisy just blows her stack. But, again, it's the wise and wonderful Mrs. Hughes who comes through with the zinger. Ivy: What do you mean? Daisy: You break Alfred's heart, so now he's alone in a city that terrifies him. You break my heart by driving him away. I don't care about your good opinion of Alfred. If you'd discovered it earlier, you'd have spared us a lot of grief. At this point, Daisy throws down her towel and stomps out of the kitchen. Ivy: What was that all about? Mrs. Hughes: Oh, I'd say it was about the fact that you had it coming. 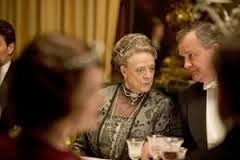 So, while there was much drama downstairs, there was much hilarity coming from upstairs, specifically from my favorite Dowager Countess and her counterpart, Isobel. 4. I loved the storyline with the gardener, young Pegg, this week. Early in the episode, Violet believes that Pegg has stolen a precious object d'art, a Japanese sculpture. Isobel lectures her on "Things, things, things" (loved that!). Isobel: I'm saying that you put too much importance on things and not enough on justice. Violet: Oh really? I wonder you don’t just set fire to the Abbey and dance round it. Later, when the Japanese sculpture is found, Isobel once again gives it to Violet. Isobel: How you hate to be wrong. Violet: I wouldn’t know. I’m not familiar with the sensation. OK, I know I'm giving more than five favorite lines this week, but this one from Violet (about Isobel) was too good to pass up. 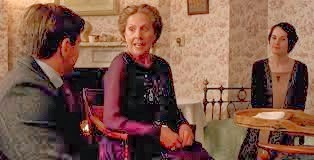 She and Robert are sitting together at the dinner table, and Robert gallantly tries to defend Isobel. Robert: She likes to fight for what she believes in. Violet: It's not a matter of what she likes; it is her fuel. Some people run on greed, lust, even love. She runs on indignation. 5. Finally, I think my favorite scene this week took place in the nursery between Mary, Tom, and Isobel. All three were reminiscing about their lost loves in such a sweet and tender way. They all obviously loved their spouses very much, and as each takes his or her turn, it becomes evident that they all share a special, but sad, bond. "Well, aren't we the lucky ones?" Yes, you are. To have loved and to have been loved so well is such a gift. It was nice to have this small reminder and this quiet moment. So tell me, did I miss any? What were your favorite lines this week? Hands down the conversation in the nursery was my favorite. So sweet that they all shared a common experience of love and now they all experience a common grief. But to see them all there with the babies was wonderful. It is nice to know that someone from the upstairs spends time with those kids! Ah, you got some great one here, Shelly.